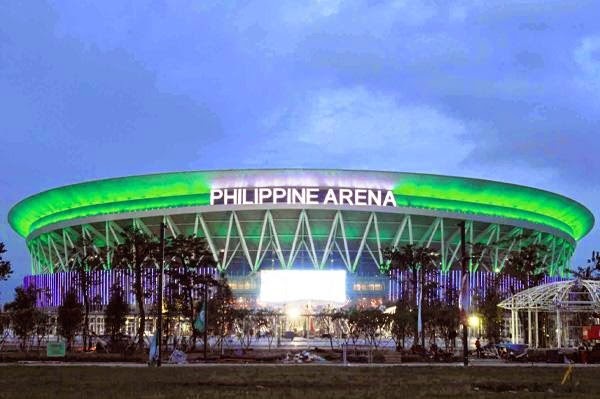 The grand opening ceremony of the Philippine Basketball Association (PBA) 40th Anniversary was held at the Philippine Arena in Bocaue, Bulacan. The first ever largest venue for PBA opening ceremony with live broadcasting through Kapatid TV5. We sure that you already watched the PBA opening ceremony through the comfort of your own home television. But we also knew that the theme song performed by Ebe Dancel, Sam Concepcion, and Gloc 9 was not clear enough at the live show. So we made this post just to give you the clear music copy of the PBA's 40th Anniversary's Theme Song. The song was written by Mr. Jungee Marcelo and Thyro Alfaro. Try to watch the music video of the song title "Ito ang Liga (PBA)," embedded below, you'll gonna love it for sure. According to the Sports5, "The PBA opened its curtains in front of a record-breaking 52,000-strong fans which trooped to Bocaue, Bulacan just to watch the games." This is also the debut game for the two teams, KIA Sorento and Blackwater Elite. Playing coach Manny Pacquiao also had first victory game against Blackwater. For more PBA games related information, Please bookmark this page for updates and you may also share this post to your friends. Comments or suggestions about "WATCH: PBA's 40th Anniversary's Theme Song (Video)" is important to us, you may share it by using the comment box below.